Our Structural Engineering reports are carried out by experienced professionally qualified Chartered Structural Engineers who are members of the Institution of Structural Engineers (MIStructE) and Engineering Council. This ensures our Structural engineer reports are carried out to the highest standards and meet Surveyors, Banks and insurers requirements. House Buyers and Commercial clients usually purchase a Structural Engineers report when a Mortgage Valuation or Building Survey has identified a possible structural defect and requires a Chartered Structural Engineer to assess the structure. Vendors purchase a Structural Engineers report when they are finding it difficult to sell a property because of a particular structural problem. The report can be very useful to clarify the concerns of potential purchasers. Clients purchase a Structural Engineers report when they are concerned about potential structural defects they have observed and who may wish to make an insurance claim based upon the reports findings. Home owners & commercial clients purchase a Feasibility report when they are planning to undertake structural alterations to an existing building, including removing structural walls, extensions or conversions. A General Structural Engineers report for home owners & purchasers includes a visual inspection of the entire property to determine the structural condition of the building. This will include inspecting all the readily accessible load-bearing elements of the property. The inspection will also include investigating the surrounding area to identify any potential risk to the foundations from nearby trees etc. The General Structural Engineers report (sometimes called a Full Structural Engineers report) will detail the structural condition of the entire property and state the adequacy of all the load bearing elements inspected. It will identify any structural problems observed and provide recommendation on how they can be rectified, or whether further 'intrusive' investigations are required. A Specific Structural Defect Report requires a visual inspection and assessment of one particular structural problem or concern and is concentrated in a specific area of the property. Therefore parts of the property not related to the specific problem may not be inspected or mentioned in the written report. Examples where a Specific Structural Defect Report can be used include visual cracking or structural problem in a localised area of the building, includes Lintel defects, Sagging roofs, ground floor slab movement, defects to garages and boundary walls etc. The Specific Structural report will specify which items were inspected and the observations and conclusions found during the inspection. It will state whether or not there is a structural concern and if so, what needs to be done to rectify the problem or what further investigations may be necessary. 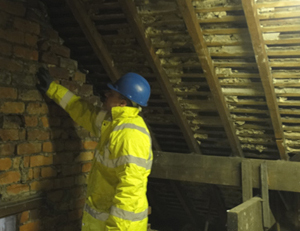 A feasibility report includes a visual inspection of a property to determine the viability of proposed structural alterations, such as removing a loadbearing wall or Chimney breast. We also carry out feasibility reports for loft conversion and extensions. The report will suggest if the proposed alterations are feasible and make general structural recommendations on how this can be achieved. The report will also highlight any structural concerns that need to be considered when undertaking the alterations and also provide an estimate of any expected structural design costs.